Your Fishing and Family Adventure Destination! 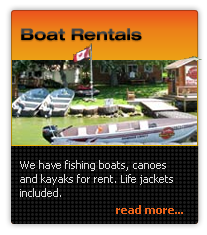 Cottage Rentals and Walleye Fishing on Bay of Quinte minutes away from the Sandbanks! Merland Park is nestled on the shores of Picton Bay just two kilometers east of the town of Picton, in Ontario. We are a quiet small resort with thirteen modern cottages and three motel units located on over 3.5 acres of beautiful trees and laneways. We take pride in the cleanliness of our cottages and the maintenance of our property. 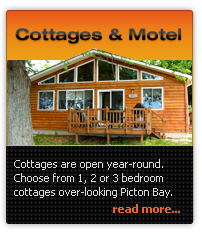 Each cottage has a large picture window overlooking beautiful Picton Bay. “Love This Place!!! !” Enjoyed a relaxing weekend at Merland Park! Fantastic owners, amazing staff and super clean cottages!! They even have an adorable dog that gets along great with the other pets in the park. We go visit Kevin’s little piece of paradise every year! Merland Park is well set up with deluxe cabins for a great price on the best part of the Bay of Quinte. 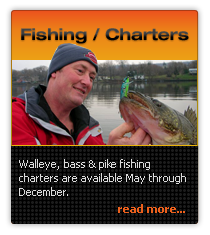 At the right time of the year we usually pull out a dozen walleye a day between 9 and 14 pounds! So tell me where else that is possible! Merland Park is the spot! Nice place to stay at. Centrally located. Boat launch, docks, and fish cleaning house all in good working order. Cottage was clean warm and comfortable. Kevin aims to please, and is very helpful. Will be returning next year.